Chop broccoli into bite size pieces. Peel and finely chop the red onion into slices, cut the red pepper into thin strips. In a bowl add the broccoli, red onion and peppers and the ingredients for the marinade and coat the veg thoroughly. Transfer veg onto a baking tray and bake in the oven for 15 mins or until starting to char and crisp around the edges and the broccoli is soft. Remove the avocado from the skin using a spoon and slice the avocados into strips. Now time to layer up your fajitas; take the 8 fajitas/ small wrap and spread an even amount of salsa on the base (almost like buttering bread). 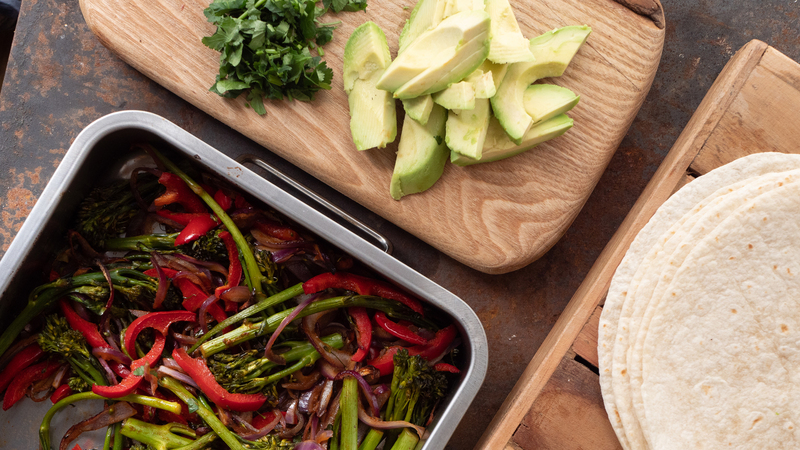 Add the charred pepper onions and broccoli, then another spoonful of salsa and a few slices of avocado and serve with a sprinkle of coriander through it.